The next embroiderer I would like to introduce readers to is someone I have been reading for nearly decade. 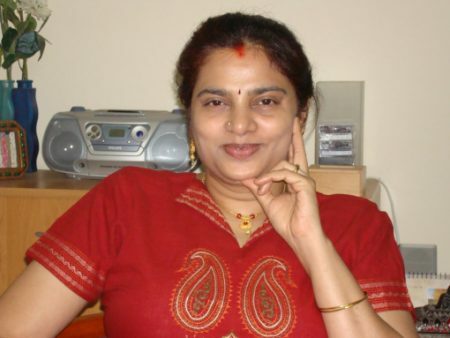 Chitra started her blog Jizee6687’s Weblog in mid 2008. I always assume that people have seen her work only to discover they have not! Chitra constantly explores stitches and works samplers of the many stitch varieties she can think of, often really pushing a stitch to see what it will do. Her constant dedication to these experiments has always made me feel there is a like minded soul quietly stitching on the other side of the world from me. Those stitching lessons are then applied to practical items, usually clothing. India has a rich textile tradition and Chitra often shares those traditions with us. When you visit her blog don’t forget to read Chitra’s tutorial on Kutchwork. There is also a tutorial on Shisha or Mirrorwork too I love the fact that we can learn a traditional stitch from someone in the culture. Without the internet we could not do that! I love colours. Hand embroidery helps in creating pieces with colours. Hand work is not perfect and that makes each piece unique. I work mainly on clothing and sometimes that gives an identity of its own. 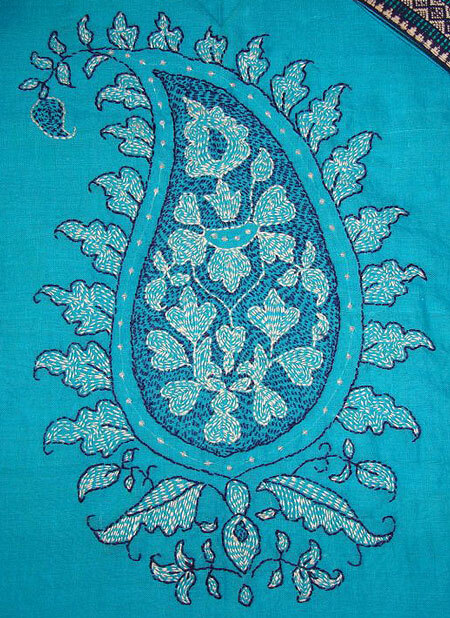 Hand embroidery is considered to be a good hobby in India. It started with my mother, widened in school, grew with help from friends/neighbours, inspired by some experienced teachers and from the onset of internet -Sharon. Still learning. 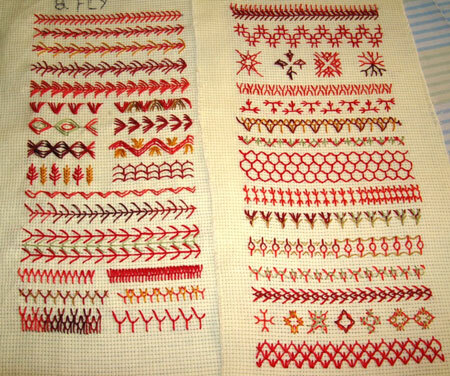 All TAST stitches are used to make samplers. The stitches are also used on other projects. Functional projects attract me. Do you have any UFO’s? If so, fess up to how many? Yes. At least fifteen have been started. Other few need to be just finished up. Too much stash of embroidery threads, notions are also piling up. And many are Unfinished Ideas. I design my projects. Occasionally on kits or designs by others. It starts with inspiration, mixing up different features, then intuition. Whenever something inspires me, I try to imagine it being worked in a particular colour scheme, type of embroidery, as different functional projects, and start giving it definition. Any particular embroidery or colour or a fabric or a picture or a location or a sewn product or a sculpture or carving are all the sources of my inspiration. I find it easy to work on a precise project. Once the definition is set, I relax, and enjoy working the embroidery. These days the projects are on clothing. It starts with a tunic design or a saree colour or a memory from childhood, an Indian sculpture or painting. Once the idea is well established, it starts becoming a project. Sharon’s online classes are of great help. My stall points are clouding of ideas. These things halt the ongoing progress sometimes. When that happens, I go back down memory lane, where there were moments of enjoying an art piece, just for its sake and not as something I would like it be. This calms my mind, and then I restart from there. My focus is basically on Indian embroidery, this aspect makes me do over and over again- kutchwork, mirror work, chains stitch. I use Anchor stranded cotton, because of its accessibility. Sometimes, when there is a chance, a small stash of other threads also are bought. I use them for samplers. Relax and enjoy working with needles. Easy to say, but it is worth cultivating this habit. Each one of us is different. Our growth shouldn’t depend on other people acceptance. Hand embroidery being a slow involves enormous amounts of sitting down time. It is better to balance our activities and get more exercise. Neck and hands are vulnerable. Taking care of them is vital. I hope you have enjoyed this TAST Interview. I certainly enjoyed discovering more about Chitra’s approach to embroidery. Pop over to Jizee6687’s Weblog for a visit as I really enjoyed browsing the samplers on her blog and selecting images for this article. There are an amazing amount of stitches and varieties on those samples! Inspired me to do my lost hobby,I have done my all marriage stuffs with my own…I know beads work too…crochet,lovely ladies thank u ….and be in our soul as our guru so that we will learn…and dedicate as u have done…. Really enjoyed your interview with Chitra. Will now look at her blog. Thank you, Sharon. Thanks for sharing your valuable experience. As a newbie I do have a problem for selecting my stitches for a particular design. Could you please guide me through? Really sometimes my mind is flooded with so many stitches randomly. That makes my design really horrible. I will keep your advice in mind from next time. Thanks once again. HI Rana – people have written whole books on just this topic so it is not something I can answer quickly. 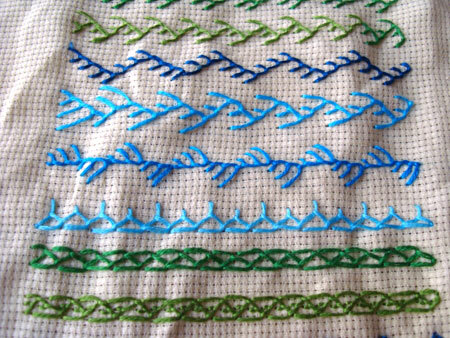 As a general guide use the linear stitches as an outline and filling stitches to fill in areas. Use maybe 5 or 6 stitches in a project and keep things simple and small to start off with. Also try your stitches on a scrap cloth and see what they work up like before using them. Hope this helps. I enjoyed reading this interview. I’m always amazed at how many variation she finds on a stitch. Like Diane, I haven’t done much exploration of TAST lately but really enjoy seeing the number and variety of designs Chitra creates. I love the blue design above- Kantha? Please keep inventing more great varieties,Chitra. Your interview was very enjoyable to read. Wonderful Chitra. Your amazing talent and artistic approach is brought out in this interview of yours. Thanks to Sharonb for having brought out the best in you. Chitra’s talent to expand and alter standard stitches has always amazed me and been a great source of inspiration. Indian embroidery on clothing is very different from what I am used to seeing on Swedish folk costumes or Japanese kimonos. As Chitra works fast there is always something new to see. Thank you, Sharon, for introducing your blog readers to the fantastic world of Chitra. Thank you so much Sharon for giving a platform to share my passion for hand embroidery. I have never seen her work, boy have I missed out…thank you so much for the introduction. Yet again another wonderful interview. Another great interview Sharon! What an interesting approach to stitching. Chitra’s work is beautiful. This is great advice no matter what our “sitting down” hobby is. She does the most complete explorations of each stitch ever!!! I would do the stitch conventionally each week and then pop over to see the million and one variations she had tried. Amazing. I imagine Chitra’s closet to be stuffed full of delightfully embroidered tunics and tops. Thank you for posting a beautiful photo of her! Enjoying the interviews. Thank you Sharron and those willing to be interviewed.